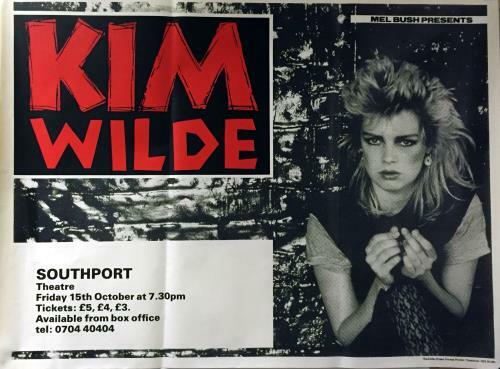 KIM WILDE Southport Theatre (Rare original 1982 UK 30" x 40" promotional poster issued to promote the show at the Southport Theatre on 15th October 1982 on her debut tour, promoted by Mel Bush. Features red 'Kim Wilde' heading, black & white image of Kim and show details. Printed on high-quality paper stock. Having never been glued to a billboard or hoarding as intended, this example has just two light creases, where it has been folded, otherwise a near as new example nearly thirty-five years on! Perfect for framing and display). or visit our Kim Wilde image gallery.